This mountain chain gives the province Malaga an unrivalled natural setting characterized largely by its great hiking trails, recommended for all ages, and the Inns where you can taste the typical dishes of the area at a great price. Walking one of the routes of Montes de Malaga, perhaps you may get to see a wild boar or a small red fox, although they are more active at night. In the Natural Park of Malaga Mountains there are 5 marked trails but you can perform many more: Pocopan, Torrijos, Contadoras, El Cerrado and Picapedreros-Boticario, with beautiful views of the Malaga Mountains a few kilometres from the Costa del Sol. The Inns offer the culinary tradition of Andalusian cuisine; a recommended and typical dish is "Plato de los Montes". 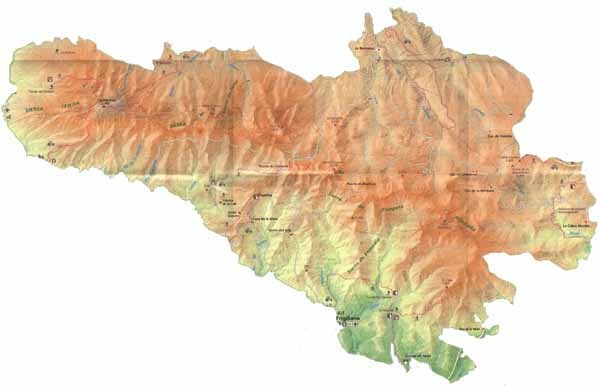 The top map shows the topography of the province of Malaga. If you want to know more about the Mountains of Malaga please consult our guide.